I have an old Kindle Reader from 2012 that I use pretty often. The problem I have with Kindles is that they don’t support epub books, only mobi. Sometimes I’ll download someone’s ebook and want to have it on my Kindle, and most processes for converting the files are pretty crappy and time consuming. It’s a super easy application you run from the Terminal to convert epub formatted ebooks into mobi formatted ebooks, and it’s free! And that’s it! You now have a newly formatted mobi book ready to go for your Kindle. I have a lot of family and friends scattered throughout the world. Most of them live in North America, so I always need to find ways to call people, and do it cheaply. When I moved to Canada, I started using cheap calling cards where you would have to enter in 400 digits to make a call, and that seemed to work fine (unless you made a mistake and had to enter in your PIN # again), but it was still expensive. Then I moved to using Vonage, a VoIP service, which had pretty decent rates ($20 / month) and worked OK most of the time, but their customer service got worse ALL of the time. Then I got a cellphone and started using Skype over WiFi – which worked pretty good but still wasn’t perfect. Until eventually I found the best solution. This might sound complicated, but it’s really not. Here’s what I do. I have a Skype Unlimited account, which gives me free calling anywhere in North America for $30 / year. This means with a good Internet connection, I can call from my phone or laptop easily for an Unlimited number of minutes, anywhere in North America. However, I don’t like relying on a good Internet connection, so I don’t use it that often. This is where the true magic happens! If you have a Skype Unlimited account, you can also use Skype to Go! 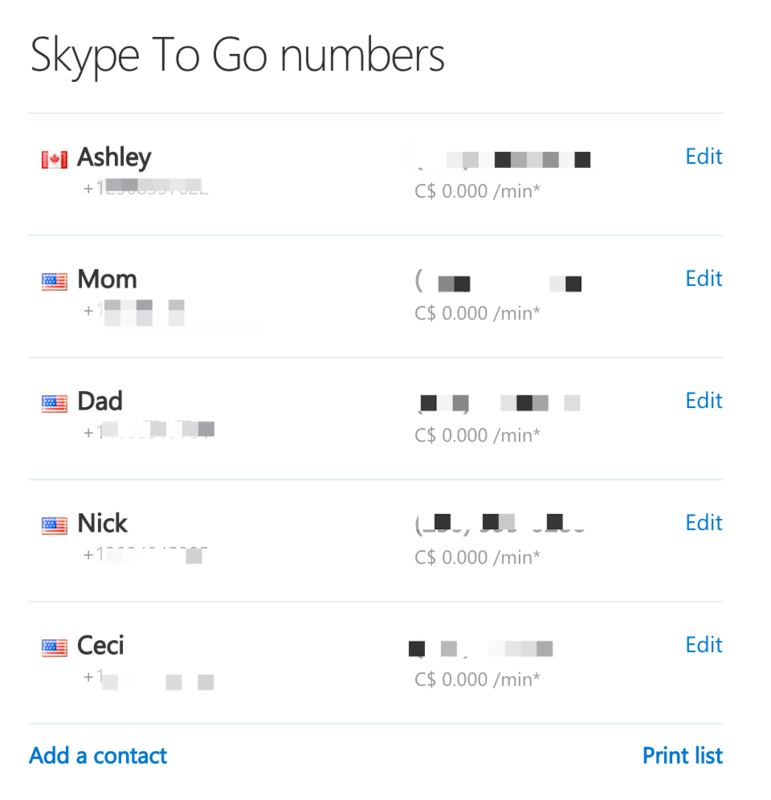 Skype To Go basically let’s you assign local numbers to international numbers. As you can see above, I’ve assigned all of my family members local Canadian numbers. So now, I can just call them on my regular phone to a local number, and Skype does the rest. The way it works is that I can only call them to that number from one of my 20 registered phones. So technically you could share this hack with like 20 family members. I’ve been using this system for about 2 years now and could not be happier, for about $30 a year I get unlimited calling to my family that lives all over the US.